Facebook’s platform is so much more powerful than we give it credit for. Even if you’ve admitted that Facebook is no longer the free promotion platform it was in 2011 and have accepted Facebook ads with open arms, it’s likely you’re still missing some stuff. This article will get into those strategies that drive the success of the most advanced Facebook marketers. I’ll give you six ways to use Facebook custom audiences to drive real-world sales and success on the platform. Have a new or updated tool? Releasing a new product or campaign? Running a sale or discount? The best people to tell about it are the ones who have already told you they’re interested in your products and have taken the step of acting on that interest. Rather than make this another “high level strategy” (as you’ve probably already heard all about lookalike audiences), I’ll just sneak it in here. Lookalike audiences are a fantastic way to drive Facebook Likes and new leads, if you’re interested in that kind of thing. Who’s more likely to Follow your business’ Page than people similar to your existing Fans or clients? 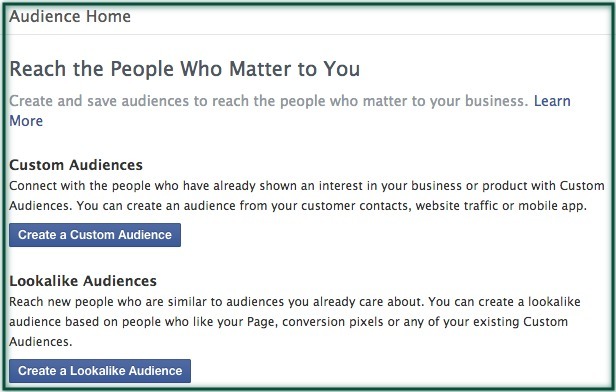 Incidentally, custom audiences are also a great way to drive Facebook Likes. It takes five seconds to mock up a “You already get my emails, why not keep in touch on Facebook?” ad targeted at a full custom audience while excluding your existing Facebook Fans. If you’re looking to collect emails from your Facebook Fans, upload your email list as a custom audience and then “exclude” that list from your post or ad to be sure that you’re not wasting paid or organic reach on people you already have in your contact list. Facebook’s introduction of WCA targeting about 18 months ago very quickly (at least for most of us) made third-party Facebook retargeting obsolete. Wishpond, for instance, bowed out in the first couple months to focus on other things. Granted there are a few things that AdRoll and PerfectAudience can do that Facebook WCAs can’t (like useLiquid, which allows your ads to dynamically change based on the pages or products a site visitor has viewed) but, for most businesses the differences are negligible – and you don’t have to pay the third-party cut. WCA’s work similarly to third-party providers do, by placing a code (or pixel) in the backend code of your website. When someone visits your site, the pixel is triggered and their name added to an audience on Facebook you can target with nurturing ads. Facebook also makes it straightforward to collect a WCA from a specific page (Wishpond might do it for each of our tools), similarly to how you would segment a custom audience list by product or tool. Just make sure your URL is accurately labeled, otherwise you’ll lose bounced traffic. Segmentation, in any marketing strategy, increases engagement. This is true across every platform and every campaign. So, of course, it’s true in Facebook advertising as well. Although your B2B or SaaS business may not have multiple tools or products, you likely have multiple landing pages (for email-gated content, a free trial, etc). As soon as you create these landing pages, immediately start thinking about how you’re going to integrate custom audience targeting into that lead list. That list of leads may be nurtured towards an upgrade with a WCA, made into a lookalike audience, or driven to a secondary “Like us on Facebook” conversion. And they’re far more likely to do all those things if your Facebook ad caters to their specific segment. This is a list of Wishpond’s most popular email-gated ebooks. When a lead or client downloads one of these we know in no uncertain terms that they’re interested in that subject. 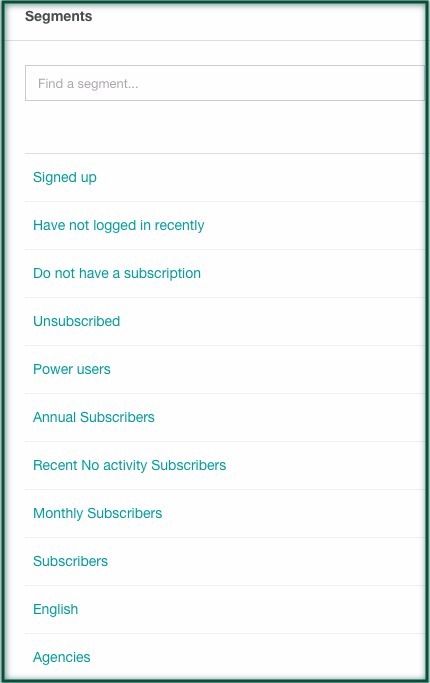 Every CRM (and most email marketing platforms, for that matter) makes it easy to see the source of your lists. Export these individual lists into Facebook to make a segment custom audience. It’s as simple as that. If you want to get really fancy you can start integrating your Facebook ad strategy with your CRM. 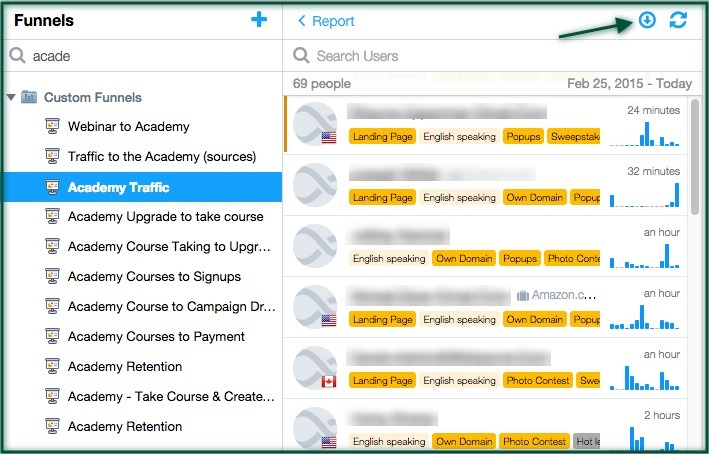 A comprehensive CRM, to be honest, makes everything else (segmentation, retargeting, etc) far, far easier. Here at Wishpond we use a CRM which allows us to track our website visitors to the Nth degree (granted, we’ll be switching to our own site tracking and CRM software in the next few months when our devs finish it, but let’s put that to the side for now). Our analytics tool allows us to hone in on leads and clients incredibly specifically: not just “un-converted lead” and “client” but “Power Users,” “Hot Leads,” “Recent No Activity Subscribers,” and much, much more. It does this based not just on the pages our site traffic has visited, but on the actions they’ve taken and even the order in which they took those actions. For instance, Wishpond’s “hot leads” are designated as any non-upgraded lead who viewed our pricing page within the past 30 days and took any 10 actions within the past two days (actions are anything from opening or replying to an email to Liking us on Facebook). These are the leads who we see as the most likely to convert to a paid subscription and may need a simple nudge with google remarketing, an email or a Facebook WCA. 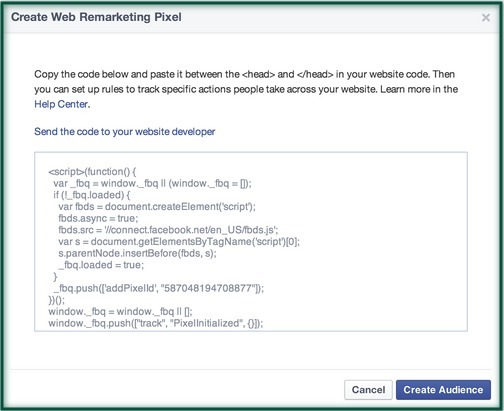 Think about it, how valuable would a Facebook ad be directed at (and only at) your own business’ Hot Leads? 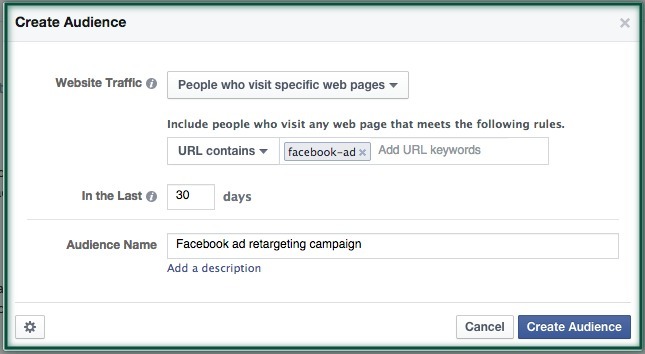 Retargeting bounced traffic is a great strategy no matter if you’re doing it on Facebook or with Google remarketing. Only a couple years ago, a bounced site visitor was lost forever into the abyss of the internet. There was nothing you could do about it. But now, with dynamic, appealing website popups and retargeting, that’s no longer the case. Target your bounced traffic with a WCA with an offer, discount, further piece of content or simply a “You forgot something!” ad. Remember to exclude page visitors who viewed the “thank you for your conversion”-type page. Otherwise you’ll be wasting ad budget on people who have already taken you up on your offer or converted. For instance, if I was to create a WCA for people who viewed Wishpond’s blog subscriber page, it would be essential that I exclude people who are already subscribers. I can do this by either uploading the custom audience of blog subscribers and excluding it, or excluding a WCA of people who have viewed the “Thank you for subscribing!” page. One of the most important parts of retargeting leads is knowing when to stop. After all, why waste ad budget on people who have already bought from you, or who aren’t going to? On Facebook, though, we have to tell our retargeting to stop (as WCA’s aren’t dynamic in any way and have to be constantly re-uploaded). So don’t forget to exclude people who have viewed your Thank You/Registration pages from your promotional advertisements. After they’ve given you their information and before they’ve converted – this is the most important period of brand communication. This is the culmination of all the strategies I’ve talked about above: segmenting leads, retargeting traffic based on actions, excluding audiences and a comprehensive awareness and implementation of CRM. 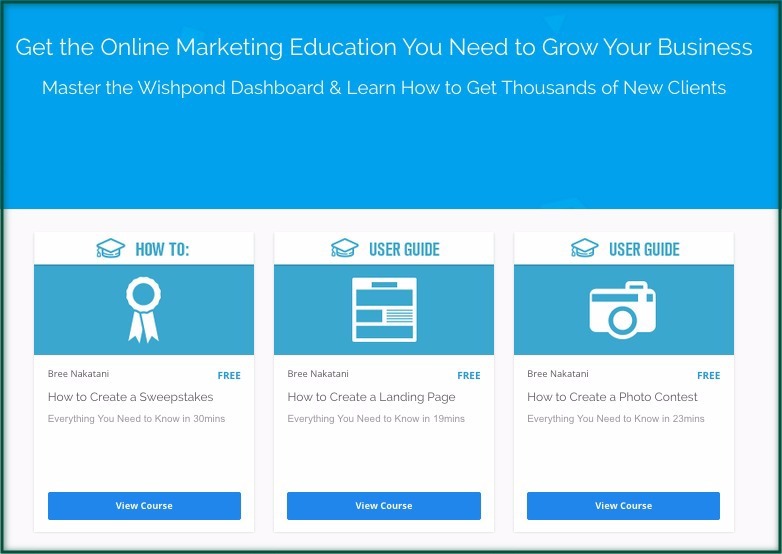 Wishpond has recently started a free marketing academy, chock-full of marketing courses, videos, and PDFs which break down everything from social contests to landing pages, popups and (yes) Facebook advertising. Promoting Wishpond’s tools to an audience of people clearly interested in what we do would be a solid use of this month’s ad budget, so let’s see how I might do it. Keeping custom audiences and retargeting strategies in mind when you’re setting up your marketing campaigns makes them far more powerful in the long run. And remember, apart from the CRM, everything I’ve shown you above is freely available on Facebook (apart from the ad budget). You just have to do a bit of homework and take the plunge. Rather than give you a step-by-step walkthrough of all of these strategies (which would take a couple hours and leave you exhausted) I’ve simply examined how they might work and why they’re powerful. If you have any questions about actually implementing Facebook custom audiences into your marketing strategy don’t hesitate to reach out to me via Twitter or email.